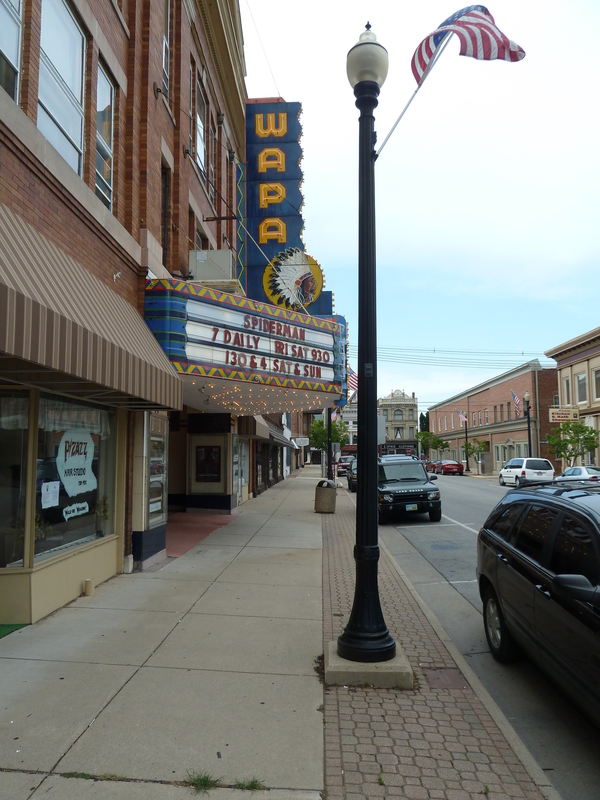 Wapakoneta, OH is small town of less than 10,000 people. It is roughly 90 – 100 miles from Toledo to the north, Cincinnati to south and Columbus to the east. 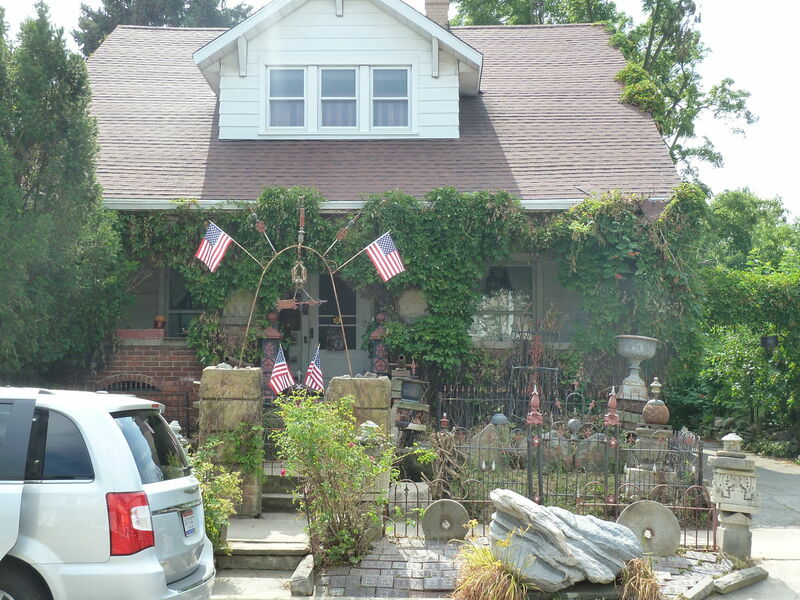 In many ways it is the archetypal small Midwestern town, the kind that looks like it is perpetually stuck in the 1950s. You can probably picture it in your head, quaint and flat, with a charming main street, nicely manicured hedges and white painted fences. In most backyards you may find a lawn chair or two strewn about, a grill, a few plastic kids toys, perhaps even an old beat up pickup truck or the long abandoned remnants of a bocce ball set. That is until you come across Jim Bowsher’s backyard where you stumble into what appears to be the colossal ruins of a long lost civilization, a world dreamed up and built by one man – The Temple of Tolerance. Bowsher, a true renaissance man – archaeologist, folklorist, historian, collector and story teller, built the temple over roughly an 18 year period between 1981 to 1999. He built it to act as a community park and safe-haven for the local kids. It is hard to describe the environment. I don’t think pictures do it justice, as they don’t adequately capture the size of yard, the immensity of each boulder, or the strange feeling you get strolling around. It is as if you’ve come unstuck out of time and place and entered a new world. 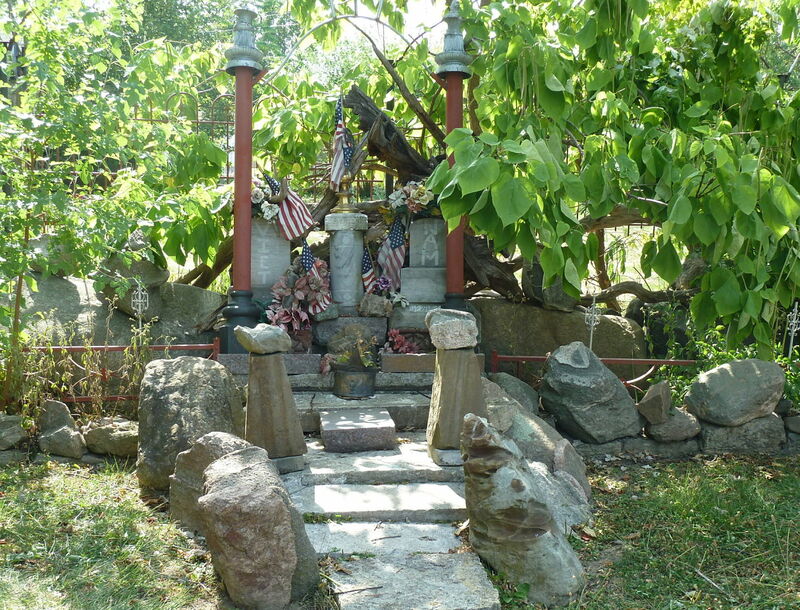 At first, the visitor passes an iron gate, through tight garden paths with some small rock piles on each side. Overgrown shrubbery and vines block the forward view. But the trail keeps going and going and going, much deeper than a residential back yard should go. And that is one of the secrets of the yard, Bowsher lives on an awkwardly wedged shaped block. He bought up the center section of all his neighbor’s backyards, so you are really just journeying deeper into a large city block. But this is all preamble for the main event – the temple itself. The forking garden paths pass a historical giant barrel house before the walkway opens up to a giant mound temple. You can summit the mound. 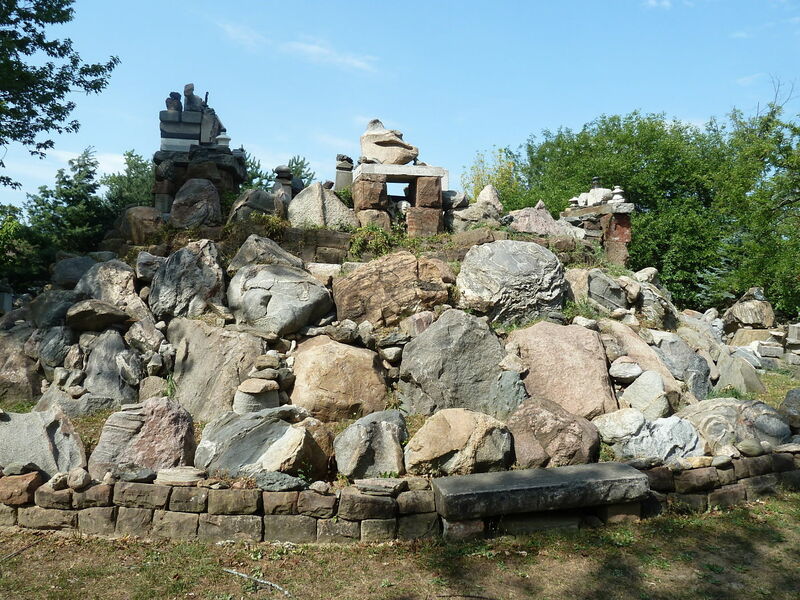 The temple is flanked by benches and other smaller mounds and rock piles, all assembled by Bowsher using multi-ton boulders that he collected from around the area. I’ve never met Bowsher in person, but I did talk to him on the phone, or mostly he talked to me; the man really likes to yak it up. One tale lead into another, into another and then into even another. World history blends with personal anecdotes that blend with parables about giving, to advice about getting the most out of life to, to tall tales and local legends. I bring this up because this eclectic storytelling and myth making is strongly reflected in the yard. The environment is the blueprint to Bowsher’s brain. Everywhere you look is a different story. The lot is littered with historical artifacts and ephemera, mixed with carefully placed rock mounds, each with its own story to tell. The yard is full of strangely compelling oddities, including a bench that James Dean once slept on, a barrel house (that once got in the way of a prohibition era gunfight, with bullet holes to prove it), the door from a jail that once housed the Dillinger gang and a Vietnam war memorial. All the relics fuse together to help Bowsher tell a bigger story about human potential and brutality. More aptly tolerance and the overcoming of violence. The different rock outcroppings have stories attributed to them either by Bowsher or the locals. On my first visit, while I did not meet Bowsher, a young elementary school kid and his dad gave me a brief tour. 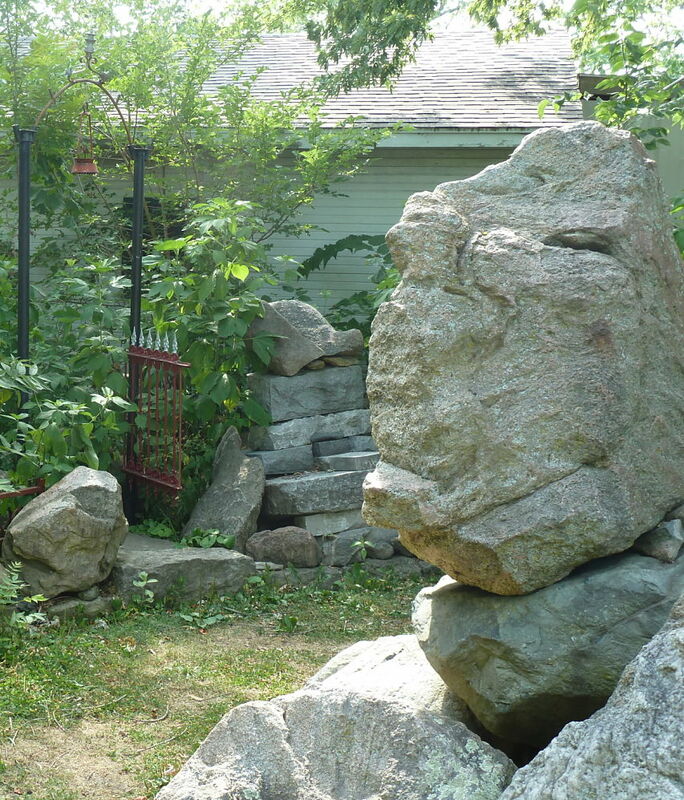 I was pointed to what the local kids dubbed, “the bully eater” – a boulder with a weird crooked human looking noggin. If kids in town are being hassled by bullies, they write the name of their bully on a slip of paper and feed it in the mouth-resembling crack. Later that night the bully eater comes to life and presumably eats the bully, or perhaps just all his food. OK, so the kid told me the consequences, I just forgot. 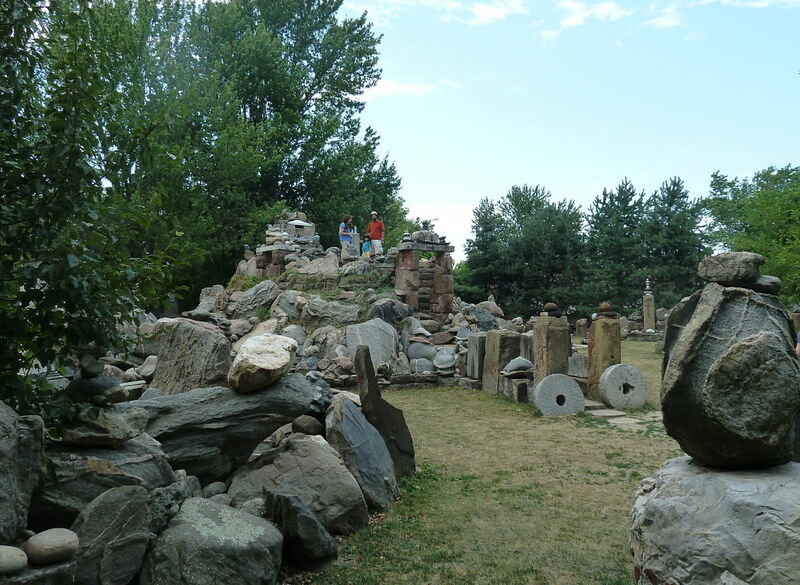 However, I do like how the people of Wapak have taken to their local art environment and use it not just as a comforting park to relax, feel safe, or hang out with friends, but also to create their own folklore and expand the town’s mythology. Bowsher does not have a website, he doesn’t even use the internet, but he loves visitors to come and enjoy his creation. How to visit: The temple is open every day of the year from dawn to dusk. There is no admission fee, but Bowsher does accept donations. No drugs or alcohol in park please, this is a safe place for kids. Bowsher says the best way to enjoy the experience is to park in front, and walk up the side driveway into the backyard and keep walking. If he is in the backyard, you may luck into a tour. Wapakoneta is located off of I-75, and is only a few hour drive from Cincinnati, three hours from Cleveland, or two and a half hours from Detroit, MI. It makes for a great road trip and there are tons of other cool things to do nearby. Too often considered a flyover state, Ohio is a top tier place for overlooked amazement and wonder. We all know there is a ton of cool stuff in New England, Florida, California and New York, but, and I will eventually talk about it more on this blog, I have found that some of America’s best kept secrets are smack dab in the middle – in Ohio, Wisconsin and Kansas, for example. There are two other great art environments not far down the road. Less than two hours south in Loveland, OH, just outside of Cincinnati, is Chateau la Roche, aka Loveland Castle, a handmade castle built after WWI by Harry Andrews. 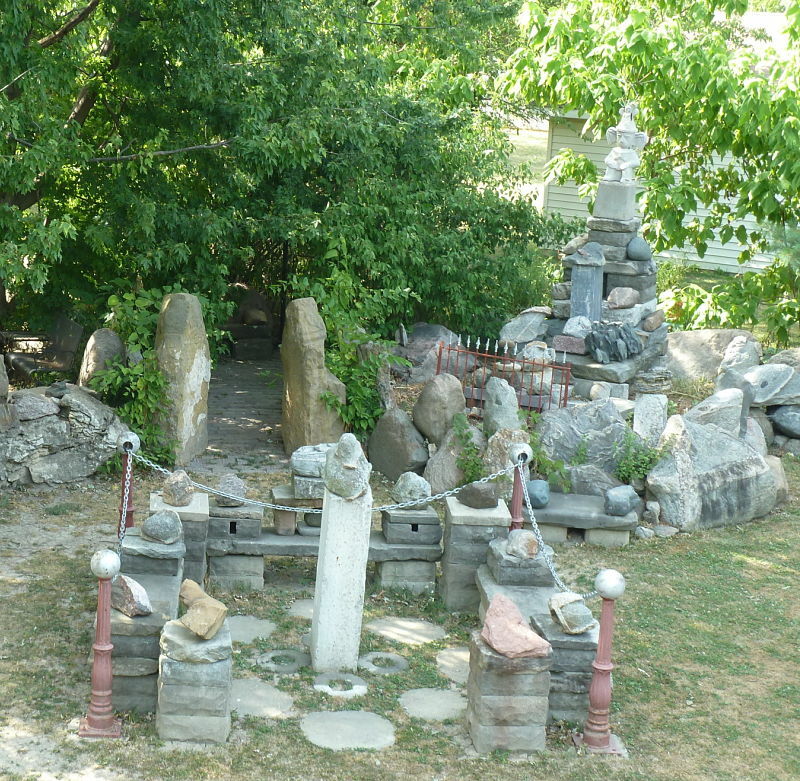 Even closer, only one hour away, heading towards Columbus, OH, is the Hartman Rock Garden, a beautiful art environment created by H.G. “Ben” Hartman during the depression after being laid off from his job. Both of these places and the Temple could easily be seen in one day, making for a very strange road trip. Even closer to the Temple of Tolerance is the Allen County Museum and Historical Society, only 20 minutes north in Lima, OH. Whereas many small local museums can be big snooze fests, the Allen County museum is chock full of weird and wonderful curiosities. This includes an exhibit on the 1930s bank robber John Dillinger and a piece created by two county doctors displaying the random stuff their patients had swallowed over the years (not food, more specifically stuff you shouldn’t swallow). But for the coup de grace, there is a small room set aside for James Grosjean’s taxidermy cabinets. This includes the largest selection in the world of stuffed albino birds (a big win for Ohio) and a working Noah’s Ark display. With the flick of a switch dead pairs of birds, yard critters and stuffed animals, go in and out of the ark on a track while music plays – simply amazing.